Industrial Plastic (Polyolefin) Wheels also known as Polyolefin Caster Wheels are injection molded from a blend of polyolefin/polypropeline polymers forming a one piece design that is solid and will not de-laminate. Great for wet corrosive environments. 3" thru 5" Wheel Sizes - Plate Size: 3-1/8" x 4-1/8"
Industrial Plastic (Polyolefin) Wheels also known as Polyolefin Caster Wheels are injection molded from a blend of polyolefin/polypropeline polymers forming a one piece design that is solid and will not de-laminate. Polyolefin Wheels are great for wet and corrosive environments while providing a high impact resistant wheel. Polyolefin wheels are more economical compared to a Phenolic Wheel or a Steel Wheel. These wheels are not affected by chemicals, solvents, oils, blood, grease, and will not absorb water. These wheels are non-marking and light in weight. Black is the standard color on plastic wheels. 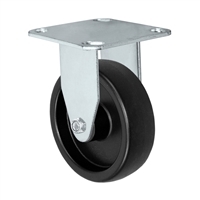 Industrial Polyolefin Caster Wheels are a great choice if your on a budget but need new wheels. These are not great when rolling over obstacles or debris such as cables or gaps, we would recommend a Thermo Plastic Rubber Wheel if you need more grip to roll over obstacles and debris. Resistant to Chemicals, Liquids, Oils, Greases, Blood, Acids, and more. 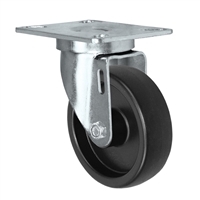 3" x 1-1/4" Rigid Caster | Polyolefin Wheel | 250 lbs Capacity | Plate Size: 3-1/8" x 4-1/8"
3" x 1-1/4" Swivel Caster | Polyolefin Wheel | 325 lbs Capacity | Plate Size: 3-1/8" x 4-1/8"
4" x 1-1/4" Rigid Caster | Polyolefin Wheel | 300 lbs Capacity | Plate Size: 3-1/8" x 4-1/8"
4" x 1-1/4" Swivel Caster | Polyolefin Wheel | 300 lbs Capacity | Plate Size: 3-1/8" x 4-1/8"
5" x 1-1/4" Rigid Caster | Polyolefin Wheel | 325 lbs Capacity | Plate Size: 3-1/8" x 4-1/8"
5" x 1-1/4" Swivel Caster | Polyolefin Wheel | 325 lbs Capacity | Plate Size: 3-1/8" x 4-1/8"